12 down, 2 to go! I fear that I am going to run out tomorrow of the Red Clover drops. I will probably have enough for the morning, but unlikely to make the afternoon. I’m going to stick with the program through end of Thursday (Day 14) regardless. If I’m really lucky, the set I ordered from drugstore.com will show up tomorrow and all will be well. I thought I would take the opportunity to share an entire day’s worth of food. This is somewhat typical, but as you have seen in earlier posts, many days we had fish for dinner. I was getting tired of fish, so decided I would mix up my dinners a little bit and get my protein from beans and grains instead. I have salmon defrosting for tomorrow night, and likely will have salad and Chinese peas to go with it. Dinner is always the biggest “planning meal” of the day because I need to feed Chris, too. The rest of my meals are pretty simple because I don’t have to be concerned about making sure he has enough food, or making sure it is something he will like or eat. Although, I must say that he is not a picky eater and would pretty much eat whatever. As you can see, the beat really changes the color of the juice! Very tasty! So pretty and so yum! I didn’t eat all of this at lunch, so had the rest for a snack after school. 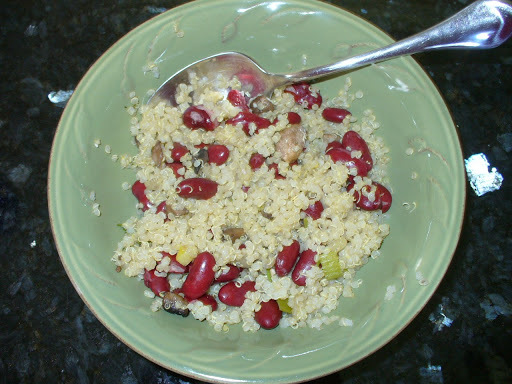 Followed by: quinoa and kidney beans. The quinoa was leftover from earlier in the week. I just mixed some kidney beans and warmed it in the microwave. Later: finished the rest of my juice from this morning and then had some Miso. I was hungry this afternoon. 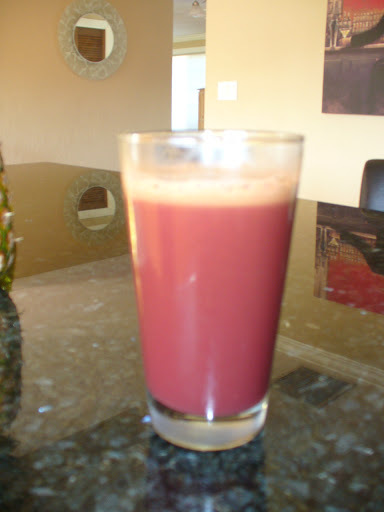 The juice and fruit from the morning had worked well until about 3:30 or so, after I was done at the gym. 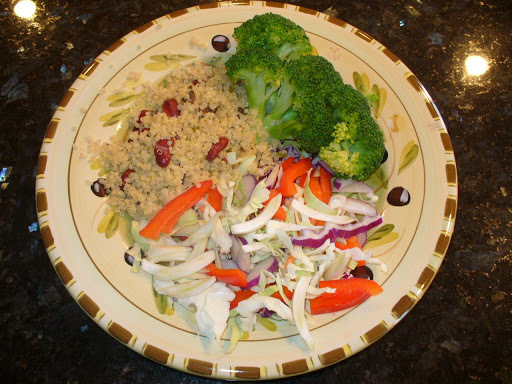 Dinner: The last of the leftover quinoa with some more kidney beans, broccoli and coleslaw. The coleslaw is just the bagged kind you buy at the store with no dressing. 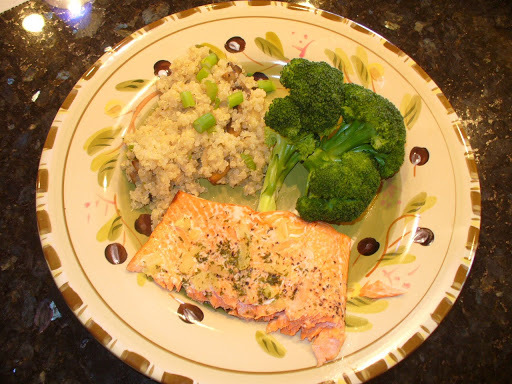 I added sliced fennel (LOVE fennel! ), red bell pepper and a purple radish. No dressing. It is so flavorful all on its own! I’m finishing up my day with some nice warm tea. That’s it. That is my food journal for the day. 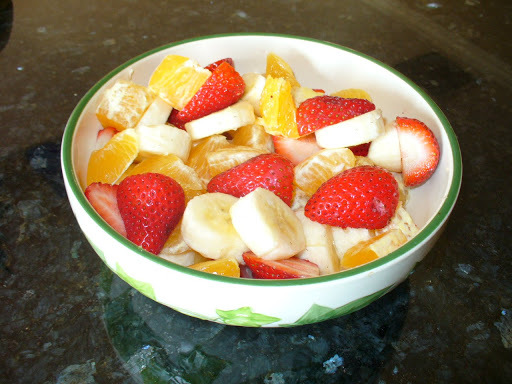 As you can see, there are plenty of fresh fruits and vegetables, a small amount of grains and little bit of protein. Some days are higher on the protein, less on the veggies, but this is a pretty reasonable representation of the type of food I’ve been eating the past two weeks, along with stuff I’ve posted previously. Cinco de Mayo is tomorrow and that would normally mean a lovely Mexican dinner and margaritas, but I’m sticking with my plan and eating my good food. This weekend I might make some enchiladas or something to celebrate. I haven’t really missed anything too much the last couple of weeks. I feel really good and that is a great motivator, plus I’ve been sleeping really well. There have been a couple times that I have wanted something like cheese, or eggs or just some protein other than fish. What I have really been wanting though is sushi! Man I miss my Sushi Hana restaurant! So far, I haven’t found a good, cheap, easy sushi restaurant here in Medford. But, I have not been craving bread or sugar. I think that is awesome for me, because I really use bread a lot for quick snacks and meals. One of the big keys for me though, in avoiding the food I don’t want to eat, whether it’s now while I’m cleansing, or just in general, is having the good stuff on hand and readily available. For example tonight, I was getting pretty hungry feeling, and it was still a while till dinner. I was wandering around in the kitchen…just…you know…looking. I was also feeling a little cold so I didn’t want to eat cold veggies. 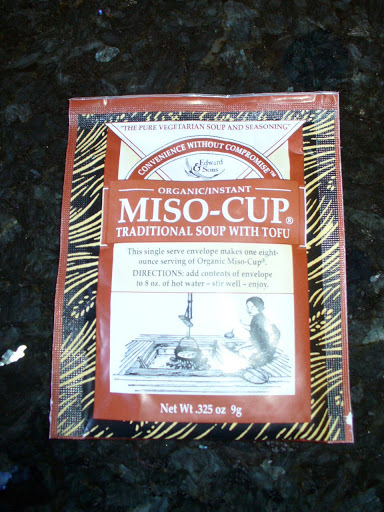 Then I remembered the Miso. Perfect! 50 calories, 2 minutes to heat the water and voila! 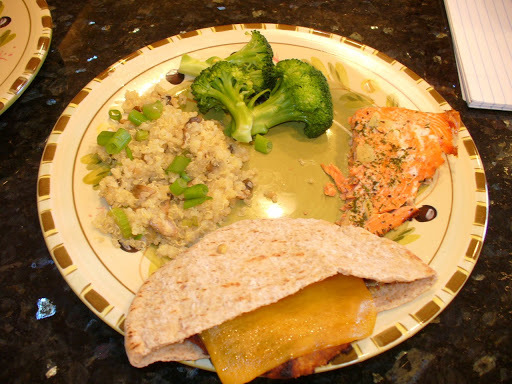 Quick, tasty, appropriate, and healthy and it filled me up. Having the right stuff, the good stuff, on hand, ready to go, is critical for me. 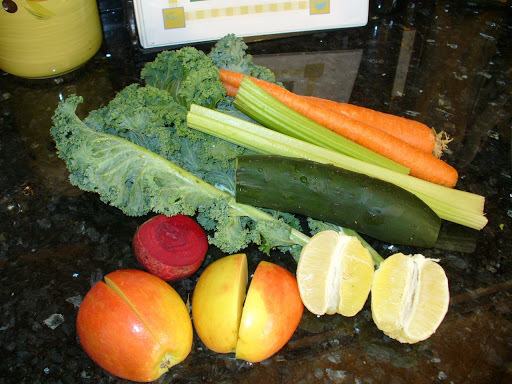 I’ll wrap up the cleanse Thursday night and post some overall thoughts after that. This entry was posted on May 5, 2010 by Corrie Beebe in Uncategorized.